A gorgeous, large-flowered variety with 6-8" delicate pinkish-mauve flowers with a carmine central bar and prominent, creamy yellow stamens. 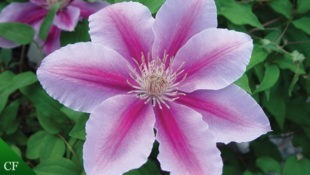 Blooms prolifically from May-June and again in September followed by attractive seed heads. Plant it 2" deeper than it was in the original pot. Bury the first set of entire leaves to encourage the production of strong shoots from below soil level.